Solus, an operating system with a rather colorful history as Solus OS, having been based on Debian at one point, is now released as a rolling distribution, most recently in the form of Solus 4.0 Fortitude. Solus 4.0 took a while to reach release due to changes in project management and various other matters. Solus 4.0 uses the latest software packages and updates in a timely fashion. The software that comes pre-installed is very sparse, meaning that users should go into Solus expecting to install other software. The package manager is a forked version of Pisi which is called Eopkg. Eopkg is not based on deb or rpm package managers so getting deb files to work might be a bit of a hassle, nevertheless, most software that newer users might find useful should be either within the standard Solus repository or the ever growing third-party repository. Snapd is also pre-installed and readily available for those who want software that isn’t in either of these. Solus 4.0 also uses one of the latest lts branch kernels. The distribution has three main desktop environments, including Mate, Gnome and Budgie with KDE Plasma in development. One of the most notable changes is the new standard dark theme in this new release. As a rolling distro, Solus doesn’t require existing users to reinstall, simply running updates should suffice, however, if you feel like you need to refresh an existing partition with a new piece of eye candy, this release will definitely cater to that. With budgie being bumped to 10.5, there is better usability and more customization to Raven and the panel. The team behind the distro released this version to tie into the new Budgie version 11 coming later this year. Budgie 11 will be a complete rewrite using qt elements in place of Gnome or gtk ones. For those Gnome lovers out there, don’t be worried, Gnome will upgrade to 3.30 by then as well. As with the previous release, the default browser of choice in this distribution is Firefox, however, users who want to use an optional one may choose from either Vivaldi, Vivaldi-Snapshot, Google-Chrome or Google-Chrome-beta which are all present in the repositories, but also you can install unsupported browsers like Waterfox, Basilisk and Pale Moon. The distribution is based out of Ireland and is independent and from scratch. Users of this distribution will be happy on Intel and AMD cpu’s and gpu’s as these are directly supported. Nvidia in my own experience, especially older systems are harder to install to, but don’t let that discourage you from trying. Solus is a great distribution and is off to a really good and fresh new start with all the changes taking place. Coinhive has shut its doors for good: Gathering your stocks by April 30th. 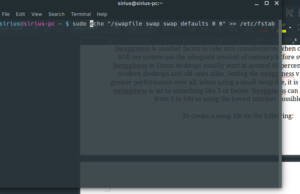 The Swap partition is something that is debated by computer enthusiasts today within Linux. The Swap partition allows the system to suspend when not in use, hibernate, and it is instrumental in swapping out pages when RAM space is sparse. Swap is the block of space reserved on a hard drive/solid state drive that allows caching when the memory is filled during heavy read/write jobs or during normal use when such an event occurs. Regardless of how much RAM you might have, it is a good idea to at least have one an half times that in swap, however, it is possible to run your computer just fine with the bare minimum of 2GB of swap. Swap is reminiscent of the Windows Page file, however, Windows usually creates a separate file for hibernating and suspend called Hiberfil.sys. Also known as virtual memory, Swap files are small portions on the hard disk which do not count as a separate partition, however, they are bits of space cordoned off by the command fallocate –length swapsize /swap file(Screen shots below). This cordoned off space lets the system use everything but that space for storage, but it sets that apart to use in the event that a program or multiple programs take all of the available space in memory, this isn’t the same as taking all the memory as the system also sets aside a cache of RAM for its own purposes. The larger the desktop, the larger the amount of RAM it might set aside. Windows and Macs do this also. The RAM set aside is mostly for the Kernel space. Kernels these days attempt to use as minimal an amount as possible, however, today, most computers contain anywhere from 16GB to 64GB of Memory or more depending upon their use case. Issuing the free command or free -h will allow you to determine how much memory/swap is being used on your Linux device. Using the command swapon -s will alert you to the device or partition that is being accessed as swap. Usually swap will come with a priority as well. This priority tells the Linux kernel to use the device with the highest priority first, much like a first come, first serve sort of thing, although, this setting can be manually changed by the user with swapon -p followed by the number. Swappiness is another factor to take into consideration when creating the swap file. Will my system use the adequate amount of memory before swapping to the disk? Swappiness in Linux desktops usually start at around 60 percent. This is too much for modern desktops and old ones alike. Setting the swappiness value lower is key for greater performance over all, when using a small swap file, it is recommended that the swappiness is set to something like 5 or below. Swappiness can be set from anywhere from 1 to 100 so using the lowest number possible is best. I recently added a function in my scripts that do this for you should the distribution not do it automatically at install. You can find those here. When installing a snap package in Linux, Ubuntu users have snapd, a snap daemon, already installed into their system. This means that as of 18.04.x you can now install snap packages as sudo snap packagename. Snaps make it easy to install a package with all of its current and up-to-date dependencies. Snaps run in containerised sandboxes so security is a priority and malware packages can’t actively change the system without user approval. Previously, a Linux user was tortured by broken packages or unmet dependencies. This is quickly becoming a thing of the past. With so much support for the new package management system, users of all distros and desktop environments can take part in having the latest and greatest software at their disposal. Even Windows is getting interested in this marvel of the modern age of computing. Manjaro and Arch users may not yet automatically have snapd installed, to ensure that it is installed on your system using pacman, type <sudo pacman -S –noconfirm snapd> in a terminal. Snap is a repository where vendors directly upload their finished projects. Opera has recently uploaded all of their desktop browser versions to the snap store. To list a package by name, type <snap find packagename>. To install a package, type <sudo snap install package>. To revert or downgrade a package in snap, type <sudo snap revert package>. To update a snap app, type <sudo snap refresh package>. To uninstall a package in snap, type <sudo snap remove package>. To make a list of all packages installed through snap, type <snap list >> snap.txt>. Snap is still in the works, so some distros will be hesitant to adopt it, but the number of packages is increasing. Chances are that a package you use is installed in the new snap repository. Users who are also developers can benefit from snapcraft a new way for people to build their own snap apps. This script will prompt the user for babynames that they are considering and will simply save them to a list of names in a file called babynames.txt. In this we are redirecting the STDOUT to another file rather than displaying them to the screen briefly before losing them. This, unfortunately only allows for four names. To add four new names or one name over multiple iterations, one would most likely want to use the first method in a loop(more about these later). Next we will be looking at if statements. My output in this scenario would be the number one. Variables are often the first thing you learn in programming classes as these are used throughout whatever project you are trying to accomplish. While scripting languages are different from Java and or C, the idea is roughly the same. Across environments, these variables are declared and used in roughly the same ways. Python to Bash to Ruby, they all use them. A final example will be an excerpt from one of my own personal scripts. This form looks for the file /etc/hosts.bak. If the file is not found, in this case, if the scenario is false it will continue to create the file and then break out of the loop. If the value were True or “0”, It would have simply returned the file name in question. We will get further into this and While loops at a later time. When performing command line tasks or (CLI) jobs in Linux, it can become tedious when there is a lot to do, for instance, working as an administrator for a small/medium/large company. Automation is very helpful when parsing large files or running multiple commands at once more than one time a day. Scripts are basically text documents that run a series of commands in succession of one another. Think of it as writing for a play. Scripts use the #! sign at the top, this is known as a shabang. The shabang alerts Bash that the following text document is a script and should be ran as a succession of lines as such. The environment comes after the shabang like so: #!/bin/env/ replacing env with the environment the script is to be read from. Most Bash ran scripts have the environment of shell. Python and Ruby use their own environments respectively. Bash and Shell are not usually the same things. Bash or Bourne Again Shell handles lots of commands very differently to regular shell. Shell doesn’t do well with complex tasks so for this reason, most complex scripts are written with #!/bin/bash. There are plenty of ways to do different tasks within bash, some commands are more complex for a more complex need, however, other complex code is used to show off a coder’s skills. Writing code in any sense tells a bit about the one writing it. Their thought processes and so on. When a developer of an os sets certain scripts to be ran from the system’s back end, many of these scripts use Anacron as a scheduler and they use #!/bin/sh as the environment. These scripts are usually found in the /etc /cron.daily monthly or weekly folders. These scripts usually consist of one or two lines to do tasks like updating the local database and updating man databases or rotating logs around. Bash is good for most needs, however, it is imperative to plan out your next script with the job in mind. What am I trying to accomplish? Will this deal with numbers or strings? How will this work automated? In the next few tutorials I will go over some basic syntax for everyday commands. I will even talk more about Systemd timers and scheduling. As I stated previously, there is no shortage in software for Linux. Each task seems to have more than one really good application. Here I will go over 10 things I can’t do without/ or software I’ve read about and really am interested in. No specific order. I will follow up with a 10 Open Source Software I Hate article later. DELUGE: I get it, I’m using Transmission right now, but Deluge is by far the best Bittorrent client for Linux. It’s open source, cross platform, and has all the essentials you would need. Most of these “essentials” are in the form of extensions or plugins. These can be turned on pretty easily within the settings. These include; blocklists, bandwidth control scheduler, auto add, and more. Deluge has some similarities with Qbittorent, however it is a QT application. Deluge works better with gtk based desktops, at least for me. PAROLE: Media codecs are extensive these days, there is no doubt that VLC at least used to be better at playing DVD’s, however, nowadays, I can play most DVD’s on my Linux machine by using Parole. Parole also doesn’t have all the specific quarrels about Qt plugins as does VLC in Manjaro for instance. Parole started back into development not long ago, after it was unsure about the future of said application, its developers finally released a new stable update to the prized application that favors Xfce desktops over anything else. It’s very light weight even in comparison with VLC. GEANY: I have a lot of fun learning code. It’s not just the satisfaction of feeling like a hacker whilst typing away at my keyboard, it’s the feeling of solving a problem or otherwise making something more accessible. Whether I’m writing scripts for Linux, learning to write something basic in C or Java, even if I’m drafting something in HTML, it doesn’t hurt to have a good IDE/text editor that can handle the job. Geany(pronounced genie), is such an application. It highlights code and handles an array of programming and markup languages right out of the box. Another runner up would be Bluefish, but it’s more tailored to just HTML. Most people complain that the white background hurts their eyes, but no one realizes that there is a way to invert the colours, I will do a tutorial on that soon enough. BLEACHBIT: It’s true, cleanup in Linux isn’t an issue. While there are a few nifty utilities that do this for you, most are concerned with just how much these applications clean. There is a good reason to be nervous when using one of these applications, but most issues from running these are based on user error. An all around simple tool for cleaning cache and other debris from a multitude of applications on the system, Bleachbit is to Linux what Ccleaner is to Windows. Bleachbit is also cross platform. Bleachbit has many similarities with Ccleaner, such as its use of an ini file to tell it what it can and can not clean. Hacking of this file could result in larger lists of applications that you can safely clean, however, for regular users, the standard list is fine. Bleachbit can also shred and wipe free space clusters as well. For quick cleaning, this is my go to. HTOP: I prefer this even over my own system monitoring app for xfce on most occasions. I mainly like this app because it seems somewhat more accurate. It also tells me exactly what is using how much in a way that pwns the competition. Htop is a handly cli version of a system monitor program. It uses your terminal to display process and RAM information all in one compact and neatly organized window. Htop also allows you some control of applications, much like its graphical counterparts. While it is a bit more complicated for new users, using it is pretty straight forward. Most actions rely on the function keys. XSENSORS: While the xfce desktop, especially in Manjaro, has plenty of sensor information available to me with the addition of the goodies package, it just seems like a more efficient use of space to use Xsensors. Like other sensor apps, Xsensors uses lm-sensors to display CPU, GPU and other relevant temperature/voltage information depending upon your motherboard’s capabilities. Xsensors can easily be added to a keyboard shortcut. I prefer using F1 for this. BRASERO: Brasero is a simplistic disc burning utility for Linux. I chose this over Xfburn, because the interface is more modern. LIBREOFFICE: While neither Linux nor distribution specific, and while not the only office utility in Linux, I prefer this for its abundance of features and its integration with projects started on either Windows or Linux and in almost any setting. It has a good selection of fonts(more can be added by adding proprietary fonts to the system). It has a good spell-checker and Language database where more can be added. This relies heavily on Hunspell package being installed on the system. The default layout is what I am used to. PLUMA: While I already gave my favorite editor, this is an editor of a different breed altogether. Pluma is based on the Mate desktop project. While similar applications do exist, this is firmly Mate desktop and stable, lightweight, plentiful enough in features that I can get simple and quick edits finished fast. It is rather ironic that if the system I’m on didn’t already come with Mousepad, I’d definitely install this one first. And there we have my top 10 loved applications for Linux, stay tuned for my top disappointing apps later. Thanks! Linux is more secure than Windows and this is no secret. Many websites and companies alike all use Linux for their servers. Some Linux desktops are more stable than others that is true, but Linux servers have fewer attack surfaces thanks to the headless(lack of desktop) by default set up. Linux servers are sturdy as there is no graphical interfaces or other useless software getting in the way. Linux servers are, in my opinion, far superior to Windows servers. This is much to do with the lack of graphical tools as well as how the system is laid out by default. Linux files are placed in order on the drive, whereas a Windows machine is constantly in complete chaos. Always moving files around to and fro. In Linux, the file system is structured in a much more organized fashion. Another way that Linux is more secure and better than Windows is that Linux uses separate accounts in Ubuntu by default. Manjaro is generally used in a similar way. Arch and Debian usually have it differently, one could argue this way is actually better, but it is more restrictive. In Debian, I have to log into root to install something, yet I can still use software from the standard user account. This isn’t remotely set up by default in Windows. This means that files and programs can only access what the user has access to while the user is running the program. Linux security depends on the file being executable, this goes back to the filesystem in that files aren’t generally executable by default, this would cause memory and cpu issues, it would mean that any file could run rampant. Writing software for Linux is a different process than for Windows. In Windows, files are typically set to executable by default and this is by design. Windows is meant to be easily accessible, probably so much so that there are more viruses targeting it as a whole. File extensions also prohibit Windows viruses from running within Linux systems as Linux doesn’t have equivalent extensions. Linux itself isn’t the Operating System, contrary to everyone’s believe, it is the kernel, however, the kernel is audited every day by thousands/hundreds of thousands of people worldwide. Most of the software on top of the Linux kernel is open-source. Open-source means that it is easily viewable as well. Every line of code can be read and accounted for. Many can’t read code, however, this doesn’t stop the many talented geeks who can. Generally this software is free, but regardless of the monetary status, Linux is open while Windows is behind closed doors.Windows is generally shut off from third party auditing. Also, unlike Windows, there is no telemetry collection either. This is something that is quickly becoming popular with computer users across the globe. Lastly, Linux has exceptional tools for monitoring and intrusion detection(Tripwire, snort, etc). It’s no wonder why so many companies and website owners use it for their backend. Linux market share is rising on the desktop slightly as well. While it still has a way to go before it’s targeted so widely as Windows, it still shows promise, and what can be accomplished with open-source software. Moving forward, we should expect to see it prosper and bloom. Linux is the future. Task scheduling is an important and useful option built into both Windows and now Linux. For a while there, if you wanted to schedule tasks in Linux, it wasn’t as easy as Windows, technically, it still isn’t, however, it has grown leaps and bounds over what it used to be. With Linux you have a multitude of options, Cron and Anacron are just two such options. Today, we’ll focus mainly on these two, the similarities and differences. What makes each of them great, what might make one better than the other depending upon the individual circumstance. Task Scheduling in Windows was a difficult thing for me to learn as well, but it was pretty straight forward once I figured it out. In Linux, you have to either use the built-in Systemd timers or Cron/Anacron. Systemd is a really good thing to use if you are trying to be more precise with regards to timing, however, that is for a later article. Both Cron and Ananacron use the system time, but what makes these two different is that Anacron runs 5 minutes after the computer is booted, then waits until the hour that the job was scheduled each day/week/month. Anacron is also picky about the shell environment used to perform system functions on such a basis. This could be a downside for new users who want to use third party scripts to handle maintenance and other things without them having to work at the system manually all the time. For those users, there is Cron, but it too takes a small amount of knowledge to set up. Crontab uses the system mail protocol which is the smtp server. Most things in Linux no longer require use of this tool as it is deprecated. This is not a requirement as many jobs can be forwarded to a log file as well from Cron. Cron is a bit more simplistic to use, in Ubuntu, the Crontab file even has a basic outline of how to use the program. Crontab also offers a convenient Home Folder backup script in the Ubuntu version. Arch users are left with a clean file, they have to know the syntax to create their own jobs. One thing that Cron does have going for it though, it can use the Bash(Born Again Shell) or the regular shell. Cron has two modes, Root and User. The two separate modes will inact functions based on respective account privileges. If you are a standard user, you might find it difficult to run maintenance or backup tasks from Cron, whereas if you are a root, you will have an infinite amount of system resources to utilize at your disposal. Anacron uses the root account only to make changes to the system, such as; updates, apt-xapien, updatedb, mandb, logrotation. Anacron has hours, days, weeks, months as its primary time settings, each of these is a separate folder that interacts on the system based on the time that anacron set it up to use when you installed your system. Both Crontab and Anacron are installed on most desktop systems and servers as of today, but this is not always the case, in Manjaro, Cronie has to be added in order to use the Crontab. In early versions of Cron, such as early Unix systems, Cron was thought of as a system service or Daemon, which was started via /etc/rc. At first, Cron didn’t have multi-user mode available on its own, it relied heavily on Unix systems for that, but in later versions, multi-user support was added. Cron uses a pretty straightforward syntax. The syntax of Cron Table(Crontab), is as follows: ex. MM HH DOM M DOW Command to execute. In other words, you’d supply the minute(MM), followed by the hour(HH), followed by the day of month(DOM), followed by the month(M), followed by the day of the week(DOW). The minutes could be any number between 0 and 59, the hours could be anything between 0 and 23, the day of the month could be anything between 1 to 31, the month could be anything between 1 and 12, the day of the week could be any number between 0 and 6 with 7 being acceptable on some systems. The Command to execute could be anything the user writes, anything tailored for the user, and anything the system normally runs. For instance, if I wrote a script to update my hosts and named it hostsupdate, say I wanted to run it once, daily at around 5:30. I could simply run the following: 30 17 * * * /bin/bash /home/$USER/hostsupdate. Of course, at this time, that will run whatever is in the script, but if I wanted to check its work, I’d have to add the line cat /etc/hosts > hosts.log in the file. If I simply wanted to be alerted that it ran, I could type the cron job with > log1 and log1 would be created in my home directory. Another way that I haven’t tried, but might be possible, running two commands together in a crontab string. 30 17 * * * /bin/bash /home/$USER/hostsupdate && cat /etc /hosts > hosts.log. Note that for a script to update the hosts file, I need to run it using the BASH shell. Depending upon your needs, Cron may be better than Anacron, however, if you just want to run a simple update procedure at the same time every day or week, Anacron is a great tool to use that is built into Linux systems already. Next week, I will probably be getting into /etc/rc and /etc/init.d along with system timers for Systemd. If you’d like to know more about these options for task scheduling in Linux, open a terminal and type man cron or man anacron. Also, there is a text based website that gives you similar information, link will be below.